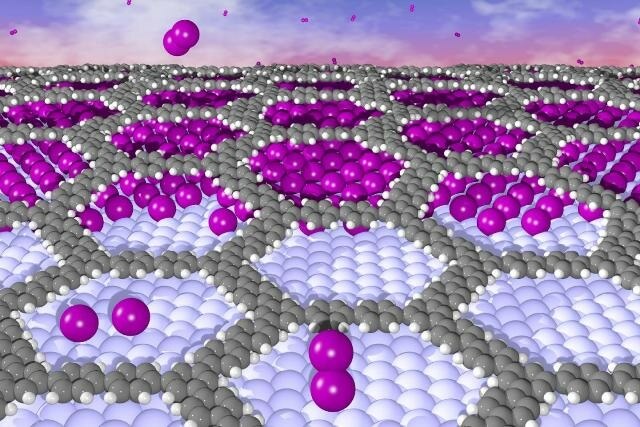 An international team has discovered an elegant way to decouple organic nanosheets grown on metal surfaces. After iodine intercalation, measurements at the synchrotron source BESSY II of Helmholtz-Zentrum Berlin (HZB) showed that a network of organic molecules behaved almost as it was free-standing. The strong influence of the metal on the network was reduced. This opens up new ways to transfer organic nanostructures from metal surfaces onto more suitable substrates for molecular electronics. The results have been published in “Angewandte Chemie”. Specific organic molecules – typically on reactive metallic surfaces – can interlink via chemical bond formation into extended nanostructures. Highly stable two-dimensional molecular networks can be grown in this manner. However, these networks then adhere to the metallic support, which also strongly influences their properties. To make use of these kinds of organic networks in molecular electronics, for instance, the metal would have to be laboriously removed. Now a team headed by Markus Lackinger at the Technische Universität München and the Deutsches Museum together with partners at other universities in Germany and Sweden have discovered an elegant way to reduce the adhesion between the network and the metal. They simply exposed the networks bound to the metal to iodine vapour. “After the networks had been synthesized on a silver surface, we used iodine vapour. We hoped iodine would embed between the organic layer and the metal”, explains Lackinger. To do this, they investigated a nanosheet consisting of interlinked phenyl rings (polyphenylene) on a silver surface. The iodine actually migrated beneath the interlinked phenyl rings to form an atomically thin interlayer on the metal surface. After the intercalation of the iodine, measurements at BESSY II proved that the molecular network behaved almost as if it was detached. The strong influence of the metal was reduced. These results could be advantageous for future applications. “Molecular nanosheets do not grow on any surface. For this reason, we have to develop transfer techniques. Then we could fabricate the networks on metal surfaces and subsequently transfer them over to other surfaces that are more suitable for molecular electronics. Being able to mitigate the adhesion with an iodine interlayer is possibly a first step in this direction”, explains Lackinger.